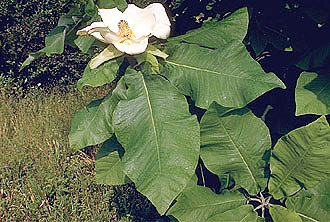 Bigleaf Magnolia - Magnolia macrophylla: A small tree with usually a straight trunk. Leaves are alternate, simple, very large (20 to 30 inches long), with wavy edges and "ear-lobes" at the base, green and shiny above, lower surface with whitish hairs. The flowers are large (10 to 14 inches) and showy, with several long creamy white petals, very fragrant. These trees grow along the appalacians from Kentucky down to Louisiana eastward to the Georgia and North Carolina.